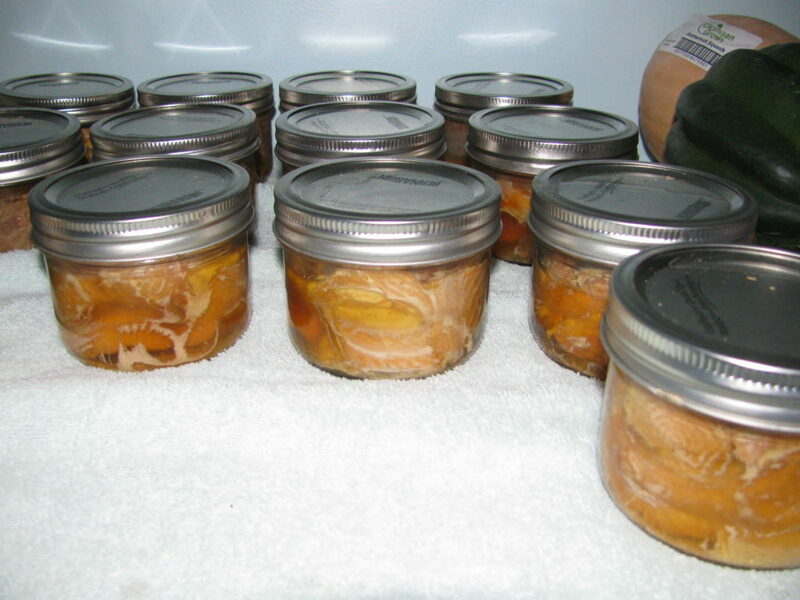 This weekend, we canned most of the Salmon we had in the freezer, leaving only 4 bags with filleted fish to eat with meals. 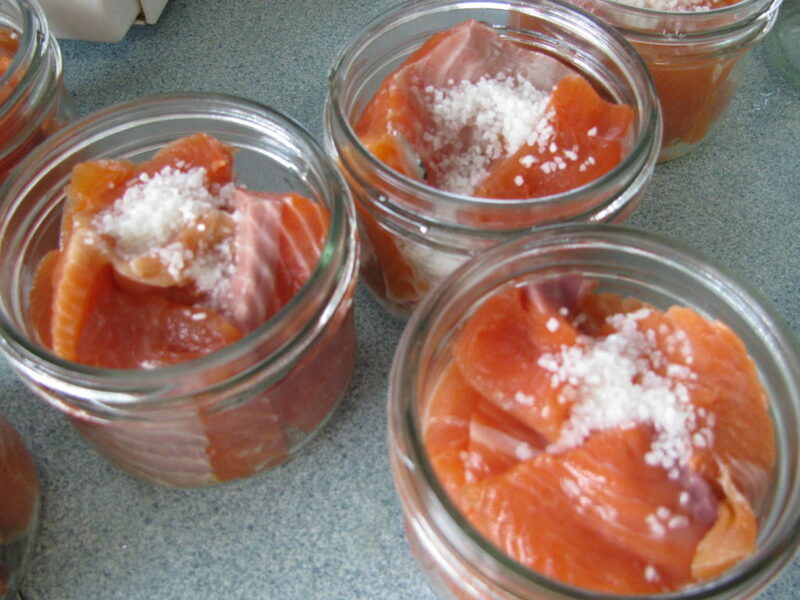 Canning Salmon is not hard – you definitely need to use a Pressure Canner. Here’s how we can Salmon and enjoy eating it all year around. We thawed the frozen fish overnight and then rinsed each piece well. 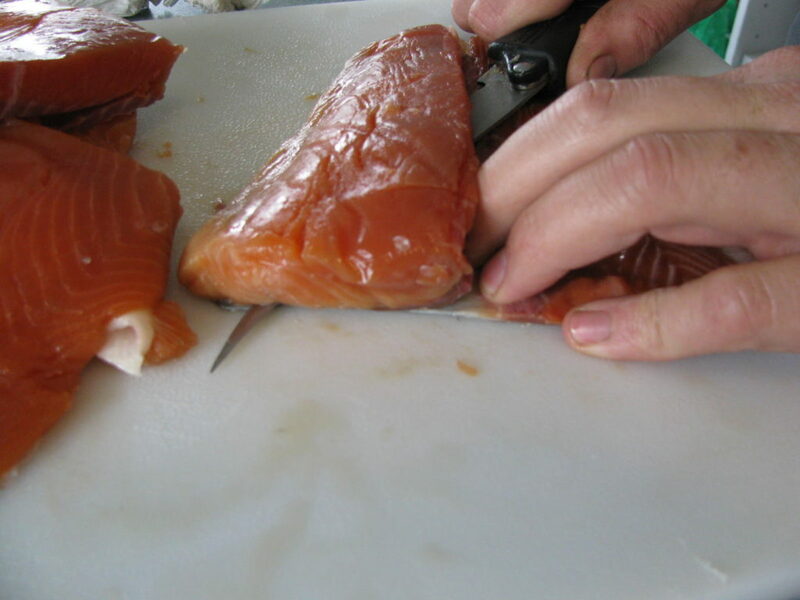 Graham then used his filleting knife to cut the meat off the skin. Meanwhile, I got all the canning equipment organized that we would need. I washed 24 half pint mason jars. 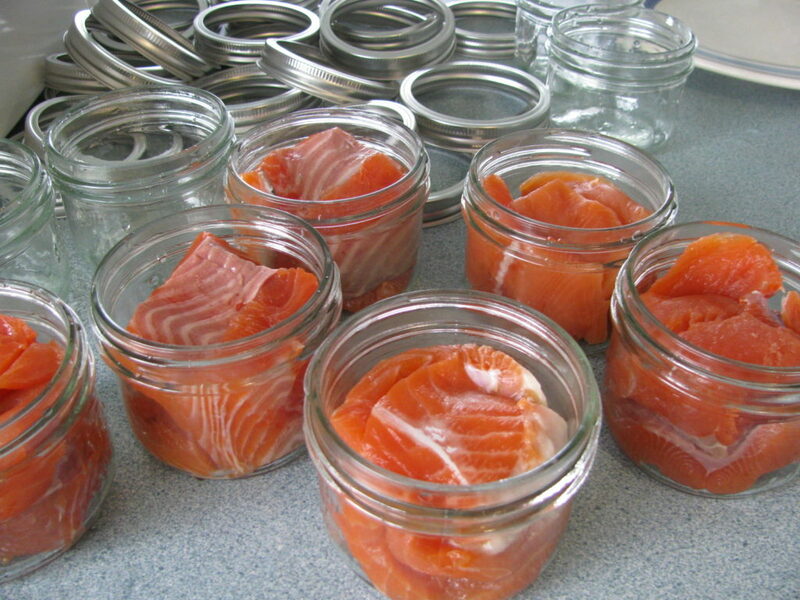 If you are pressure canning, you don’t need to sterilize the jars, like you do when you water bath can. The jars however do need to be clean and I always wash them out in soapy water before reusing them. I got the canning lids soaking in hot water and set all the lid rings aside. Here are the jars all cleaned and ready for fish. Graham cut each piece into smaller ones that will fit in the small jars. We like to place the first pieces of fish in the jar so that they are along the sides, then start stacking pieces in the middle of the jar. Make sure the pieces are not so long that they can interfere with the seals. Once filled, I added 1/2 teaspoon of coarse salt and 1 teaspoon of lemon juice to each ar. I cleaned off around the rim of each jar. Then I put on the seals, which have been soaking in hot water and finally, adding a ring to each seal. Once we had enough water in the pressure canner (we added 4 quarts) we put a layer of jars inside. Since we have a pressure canner rack to separate levels of jars, we put that in and have two levels of jars. This way, we were able to process 14 jars at a time. If you want to process a lot of jars at once, you need to use a rack to keep the tops of the jars from hitting the bottom of the others. Close the canner and turn up the heat on the stove. Once it starts steaming, we time it to vent like this for 10 minutes. After that, we add the weight (15 lbs, because of our elevation) and waited for the canner to again start steaming. Once the ball weight starts to jiggle and let out steam, we can slowly start to turn down the heat under the canner. Set the timer for 90 minutes and let the canner do its thing. After 90 minutes, I turned off the stove and let the canner sit there to start cooling down. This takes awhile, but it’s really important to not open the canner too soon. Once it cooled down, I removed all the jars and set them off to the side where they can sit undisturbed for 24 hours. By then, I can give the jars a good wiping and store them in the pantry. In the end, we ended up with 22 half pints of salmon. We’ll enjoy this all Winter long! This is an excellent post, Annie! I know you actually catch your salmon and I envy you. I used to fish as a kid with my parents, but now the fish in our country (US) is not safe to eat. Especially in my state of NY! Salmon is so expensive to buy, but if I found a safe source of it, I’d love to can it like you did here. We do catch our own, Kathy. I know what you mean about fish living in polluted waters. A lot of people here are worried about the west coast fish being contaminated by the fallout of the Japan disaster last year.